Indian food. 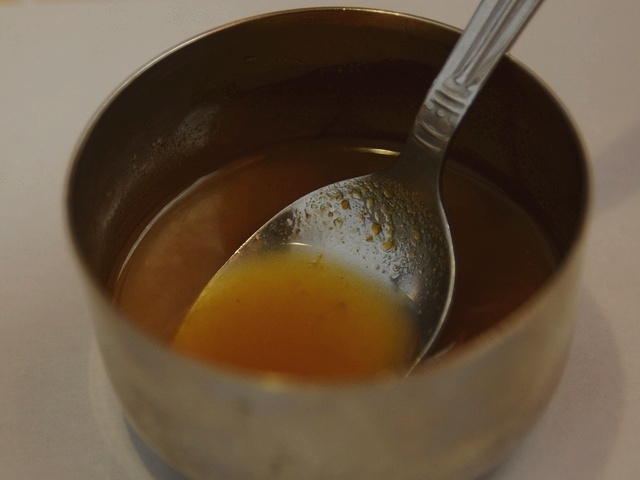 Recipe for Rasam. Traditional preparation involves tamarind juice as base in addition to tomato, chili pepper, Pepper, Cumin and other spices as seasonings. Soak tamarind in hot water for 10 mins, squeeze and dissolve pulp in the water and strain. Put tamarind liquid, garlic, pepper, cumin, water, salt and coriander into a sauce pan and bring to boil. Turn heat down and simmer for 10 minutes. In another pot, heat oil and fry mustard seeds and curry leaves until leaves are brown. Add to the simmering liquid.